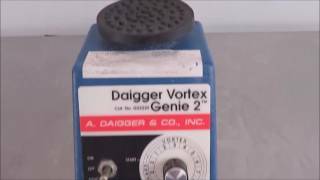 The Daigger Vortex-Genie 2 Vortex Mixer is a flexible lab mixer with speeds between 600 and 3200 RPM. The three position power switch lets you select either continuous vortexing action or touch on. For touch on use, simply place the flask to the platform and apply pressure, and the vortexing will activate. When vortexing is complete, remove the flask or the test tube from the platform of this lab mixer and the action will stop. The Daigger Vortex-Genie 2 Vortex Mixer has true vortexing action that prevents spilling even when tubes are uncapped. The rugged cast metal housing of this lab mixer has enough weight and rubber feet to keep the instrument from walking across the table. The 3” platform is made of a chemically resistant thermo plastic rubber, provides a stable platform for all types of mixing and can be easily removed for cleaning. This Daigger Vortex-Genie 2 Vortex Mixer has been thoroughly tested and performed as expected. All of our lab equipment comes backed with our standard warranty. Should you have any questions, please don't hesitate to contact us.